McALLEN — City commissioners voted Monday to ban smoking in most public places and inside all establishments besides bingo halls. 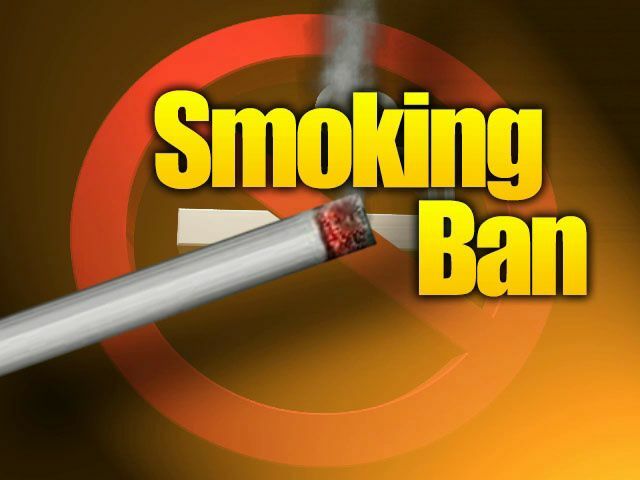 Smoking will not be allowed at parks, or inside bars and restaurants, the new ordinance will state. Smoking will be allowed on patios and rooftops of an establishment so long as the smoker is not within 10 feet of the entrance to the establishment. Any business that brings in more than 40 percent of its revenues from tobacco products will continue to allow smoking inside. This ordinance will likely go into effect on Jan. 1, 2018. Commissioners Richard Cortez, Omar Quintanilla, Aida Ramirez and Veronica Whitacre voted in favor of the new smoking ordinance. Commissioners John Ingram and Joaquin “J.J.” Zamora voted against it. Ingram cited many reasons for his disapproval of the ordinance, including adults being able to make decisions for themselves whether to smoke or not and not wanting to shut down businesses because of city regulations. Zamora wanted a harsher smoking ban, including prohibiting smoking inside bingo halls. Many of the more than 25 people sporting red T-shirts and signs advocating for the new ordinance clapped when it was passed at Monday’s city commission meeting at City Hall. American Heart Association representatives said they were pleased with the ordinance. Jerry Saavedra, from the American Heart Association, called the passing of the ordinance a victory. In passing this comprehensive smoking ordinance, McAllen joins Brownsville, Donna, Edinburg, Harlingen, Pharr Weslaco and other Rio Grande Valley cities to have enacted regulations regulating smoking in public places. The Tobacco Prevention and Control Coalition — a partnership comprised of the American Heart Association, American Cancer Society and Behavioral Health Solutions of South Texas — now considers McAllen part of its network of cities that have comprehensive smoking ordinances. Several businesses in McAllen’s Entertainment District on 17th Street could be impacted by the new ordinance. Multiple bars allow smoking indoors with open windows. One owner of four bars on 17th Street talked about the possibility of losing substantial business. Mayor Jim Darling gave a personal anecdote to try to help settle both sides of the discussion, which took more than 30 minutes.